14kt white gold ring featuring a breathtaking trillion Kunzite gemstone of 14.88ct bezel set with .13ctw of round brilliant Diamonds set on 2 sides of the stone. 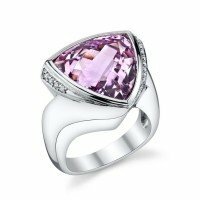 The high polished shank is a contemporary curved design. This is a Jorge Adeler custom design.